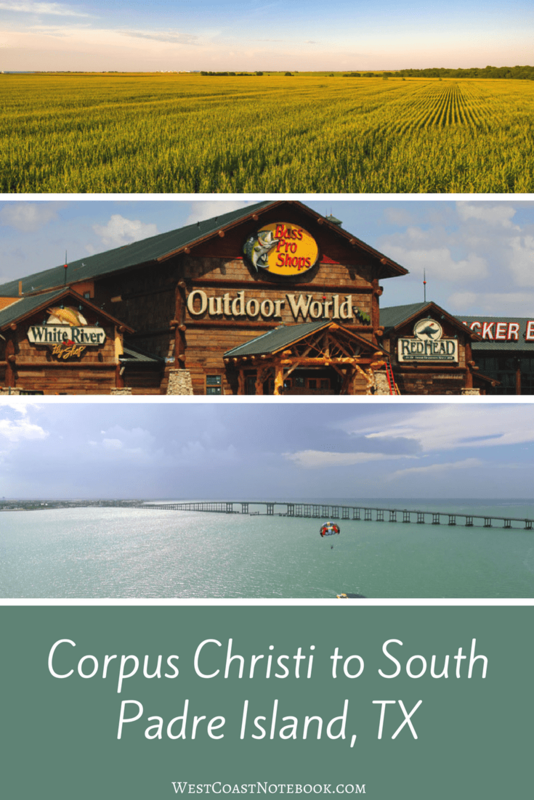 Today we went from Corpus Christi to South Padre Island, TX. We got up early and checked the weather. Cold in Corpus Christi as the cool air headed down from the north and the warmest place we could find was South Padre Island, so down the road, we went. The sky was overcast and there was the occasional rain shower as we left for the 2.5 hour drive ahead. But driving with us is sort of like going for a walk with a birdwatcher. There is a sign posted around one of our local lakes which says it all. The walk around the lake is 30 minutes unless you are a birdwatcher and in that case, can take at least 2 hours. Puttering along the way we stopped at anything that interested us and I watched the mileage as we passed mile after mile of tilled fields. The longest field I can remember was just short of 5 miles wide and who knows how far it went back. It would take days to plough and or harvest the field. The farms went on one after another until they all seemed to blur together with the occasional farmyard in between. They do things BIG in Texas! Just about a half hour before we got to our destination we stopped in Harlingen for some lunch and to stretch our legs. Rob spotted a Bass Pro Shop so we headed there. They build one in Tsawwassen, BC which is on the Vancouver side of the ferry we take to get off Vancouver Island and we’ve never stopped at it as we are always in a hurry to get to the ferry or somewhere when we get off. But… if you get a chance to go into one, I would highly recommend it. First of all, IT IS HUGE! They have a stream and pond outside along with an acre of boats and when you walk into the entrance it’s like going into a hunting or fishing lodge. Disclaimer: if seeing stuffed animals is not your cup of tea, I wouldn’t suggest going there or reading this section… just skip down to below the video. The store has high, really high ceilings and aisle after aisle of merchandise. There were 3 aisles of fishing rods about 30 feet long with rods on both sides. How would one ever make a decision? The staff were really friendly and helpful even though we were just sightseeing and everyone we talked to loved working there. One of the reasons for the high ceilings was for all the animals that were displayed there. If you wanted a natural history lesson, this was the place to come. All the animals had been to a very good taxidermist and were placed in their natural setting. The deer were in a forest or field, a bear in the woods, the cougars on rocks and the mountain goat at the very top of the building on a mountain. At the other end of the store from the entrance was a huge fish tank that was set into the wall and I could have stood and watched it for hours. I can’t do the store justice, but I found a video of the store when it opened in 2011 which gives a good overview of it. Really was amazing. We talked to one fellow in the store and he had actually come up to Tsawwassen to help set that store up up and he said it was even more impressive than the one we were in. After an hour just walking around, we got back on the road again to South Padre Island and arrived late afternoon. Heading for a hotel that we had stayed in last time we were down The Inn At South Padre Island. This was the nicest place that we have stayed on our trips and you are greeted at the desk like a friend who stopped in for tea. Our luck was with us as they only had one room left and we snagged it. We ended up staying four nights there and every night we got a different room depending on what was available. This was because like a lot of hotels in this area they take in guests for a month at a time during the winter. There were people from all over the US and a few from Canada where the country was normally in a deep freeze at this time of year. The reason it was so hard to get a room is that 90% of the hotel is made of monthly paying guests and for a regular room it’s $1500 USD a month. If you want this type of deal you need to put in a year ahead of time. Most of the people that were there were retired and the only time they didn’t make it down was if they had gotten sick or passed away. So you could go on a waiting list if you wanted to get in on the action. It was like a huge club where they played cards in the evening, had movie nights, and people did things together like going shopping etc. The way I looked at it was instead of going to Palm Springs and taking your motorhome, it was the same sort of atmosphere, except you were in a hotel. If you have a look at the link to the hotel above you can see the size of the rooms and they wouldn’t be hard to stay in for a month. They all have some kitchen space and are the biggest hotel rooms I’ve ever stayed in. If you are really lucky you could get one on the ground floor with an outside exit door and a jacuzzi in it. One night we ended up with one of them and it was lovely. But… in the meantime, they have very little internet connection. You see everyone down in the lobby on their cell phone, tablets or computers. And slow… but what the heck, the weather was lovely, the rooms great and there was internet of a sort. I ended up for the first couple of night in the hallway of the second floor right outside the elevator as that was the only place I could get a signal. I felt like the welcoming committee and everyone wanted to stop and chat. I can’t say enough good things about this hotel. Here’s an example of the type of service they provide. We met a fellow and his wife when we were using the hot tub and Rob was mentioning that in a lot of hotels we go to the hot tub is either not working or lukewarm. The fellow said when they got to this hotel the heater wasn’t working but the jets were, so he went up to the management and put in a complaint. They had someone out the next day to fix it but in the meantime, they strung a garden hose through an upstairs room to a tap and ran hot water into the hot tub and then topped it up every once in a while when the water cooled down. In talking to some of the locals, we found out that South Padre Island no longer advertises or promotes itself as a party destination for spring break and summer etc… Instead they promote families and a safe place to come and enjoy your holiday. They say that it’s really cut down on the problems associated with lots of college students coming to have a party. That said, the hotel rates double and sometimes triple during spring break so obviously people arrive during that timeframe. As we were there just before spring break started it appears that at our hotel and others in the area a ritual takes place at this time every year. All the long-term residents that have been there for a month or longer do a mass exodus as they don’t wish to incur the added expense of the room rates going up. This is preceded by a tailgate party in the hotel parking lot and we were invited to attend because after you’ve been there for a couple of days your like family. Due to a lovely day and the birds cooperating we ended up not going to the party and were thoroughly questioned about why we missed it the next day.